^ Hartman, L. F. and Oppenheim, A. L., (1950) Supplement to the Journal of the American Oriental Society, 10. ^ Sandars, N. The Epic of Gilgamesh. Penguin Books Ltd, London, England. 1960. ISBN 978-0140441000. ^ Ackerman, Susan. When Heroes Love: The Ambiguity of Eros in the Stories of Gilgamesh and David. Columbia University Press. 2005: 130–131. ISBN 978-0231132602. ^ George, A.R. 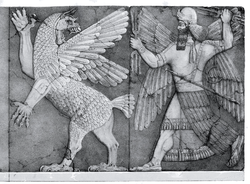 The Babylonian Gilgamesh Epic: Introduction, Critical Edition and Cuneiform Texts. Oxford University Press. 2003: 498. ISBN 978-0198149224. ^ Perdue, Leo G. Scribes, Sages, and Seers: The Sage in the Eastern Mediterranean World: The Sage in the Mediterranean World. Vandenhoeck & Ruprecht GmbH & Co KG. 2009: 57. ISBN 978-3525530832. ^ 韦斯特, 马丁. The East Face of Helicon: West Asiatic Elements in Greek Poetry and Myth. (Oxford 1997) 402-417. ^ Abusch, T. (1993) Gilgamesh's Request and Siduri's Denial. Part I: The Meaning of the Dialogue and Its Implications for the History of the Epic. The Tablet and the Scroll; Near Eastern Studies in Honor of William W. Hallo, 1–14.